Leaders need emotional intelligence to succeed. Jennifer Bridges, PMP, explains why and shows you how to improve your emotional intelligence. There are many intelligences, or to put it another way, intelligence isn’t measured solely by one metric. Jennifer spoke about the growing acceptance of something called emotional intelligence in the workplace. Emotional intelligence (EI) has become a key to unlocking the management potential for project managers and other leaders, whether they’re managing a project, defusing a conflict or just conversing over lunch. The definition of emotional intelligence is the capacity to be aware of, control and express one’s emotions and handle interpersonal relationship with empathy. Empathy is when you can feel what others are feeling, which is the cornerstone of compassion. Other components of having emotional intelligence include perceiving emotions, as stated above, but also understanding the emotions of others and your own—then being able to use and manage those emotions. To break that down into practical examples, emotional intelligence begins with self-awareness and self-management. That means identifying and understanding emotions when they come up personally, but not being controlled by them. Having self-control and being able to adapt is key, as is staying achievement oriented and keeping a positive outlook, according to Jennifer. The next step is being aware of the emotional landscape outside of yourself. This includes having a social awareness of others, being empathetic and being aware of the organizational environment. With this comes the ability to manage relationships more effectively through influence, coaching or mentoring. This enables one to resolve conflicts and encourage teamwork while inspiring others. What place does emotion have in business? It might sound as if EI is a soft skill, which it is, but no less important to leadership than the more championed hard skills. For one, it helps improve a leader’s ability to make decisions because it offers a wider lens by which to see which course is the correct one. Naturally, understanding one’s emotional ebb and flow will increase their personal well-being, but it also acts as a value to release the pent-up stress that comes from working life. That positive influence isn’t only personal but spreads to teams and increases their performance, which in turn fosters loyalty and reduces staff turnover. No matter how in touch with your feelings or empathetic you might be or not be there is always room for improvement. Emotional intelligence isn’t like a light switch, once flicked on, it stays on. It must be worked on. Here are some ways Jennifer suggested to improve your emotional self-control. Don’t explode when things don’t go your way. Yes, it can be frustrating, even maddening, but emotional outbursts only create more tension, instead of relieving it. Don’t take credit for everything. You’re not an island, as the saying goes, but part of a team that works together and succeeds together. Taking all the credit is factually wrong and will result in resentments. Don’t brag about how good you are. Again, whatever accomplishments you’ve achieved on the job are the result of many not one. Plus, such an attitude hints at hidden well of insecurity. When you’re working with others, Jennifer had these suggestions to improve your empathy. Be aware of others’ emotions. The first step to empathy is identifying emotional states in others. Detect when someone is shutdown and upset. Even just asking if they are is a start to opening their feelings and yours. Leverage information when resolving team conflict. Pro-Tip: There are many ways to develop emotional intelligence; Jennifer only highlighted a few. Another way is humor. A sense of humor offers a perspective that allows you to see things differently and not take things too seriously. 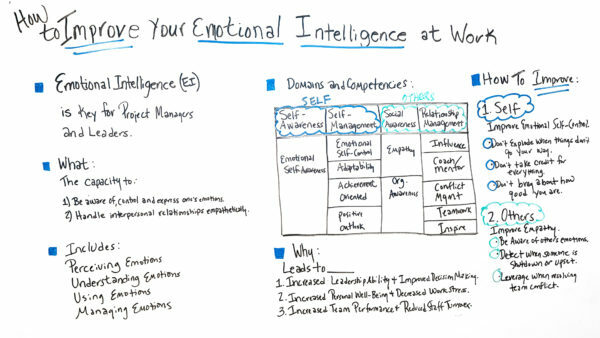 Today, we’re talking about how to improve your emotional intelligence at work. Well, before we talk about how to, I wanna first clarify what it is and why it matters. Well, it’s said that emotional intelligence is key for project managers and leaders. What do we mean when we talk about emotional intelligence? It’s the capacity to be aware, control and express one’s emotions and handle interpersonal relationships empathetically. So what all does it include? Well, a lot of emotional intelligence is the key word emotions. So it includes perceiving emotions, understanding emotions, using emotions, and managing them. So when we talk about emotions and we talk about different domains and competencies, it’s broken down into self and others. And so when we talk about self, it’s self-awareness. Really having emotional self-awareness, understanding what your emotions are when they come up, what triggers them, again, and how to leverage them falls under the self-management part. So it’s emotional self-control, adaptability to certain situations, achievement oriented, and positive outlook. So when we talk about others, we’re looking at social awareness in relationship management…in relationship to the other person. So it’s having empathy. It’s having organizational awareness. Again, knowing what’s going on with emotions, with different people in the organization. So relationship management is understanding how to influence, how to coach and mentor others, how to resolve conflict, how to establish teamwork and even inspire others. So why does it matter? Well, the research shows that it leads to increased leadership ability and improved decision-making, increased personal well-being and decreased work stress, and increased team performance and reduce staff turnovers. So, to me, those are some very strong benefits and reasons why we care about emotional intelligence at work. So when we talk about how to improve, I wanna look at two different areas, one with self and others. And so here’s just an example in these two. I wanna look at the 80/20 rule. What are two things that will give you the biggest bang for your buck? So improve emotional self-control. So when you’re a project manager or when you’re a leader, maybe have different initiatives and deadlines are very important, the stakes are high, and sometimes the team frustrations get high. Well, one thing to do is we know on projects things don’t go always as planned. So one thing is don’t explode when things don’t go your way. Be able to control your emotions, understand, you know, the reasons why things aren’t going that way, and realize there are other members on the team that are working really hard to make things happen. Also don’t take credit for everything. We’ve all been in that situation where we’ve worked really hard and someone else has taken the credit for what we’ve done. Well, that triggers other people, so that’s not high awareness of other people and the work that they’ve done. Also, don’t brag about how good you are. If you’re in the project manager position or the leadership position, by bragging and acting like you’re superior than others is naturally going to either trigger others, maybe shut others down, and you really need the high performance of the people on your team. When we look at others, it’s really improving empathy with others. And ways we can do that is be aware of other’s emotions. There are certain things that trigger other people. We actually have human beings who work on our teams and sometimes things are happening outside of work that impact their emotions. So being aware of that and really determining, detect when someone is shut down or upset. Because if someone’s shut down or upset, again, they’re not performing optimally. And then also leveraging this information when you’re resolving team conflict is very powerful. So these are just a few ideas on how you can improve emotional intelligence at work. And if you need some additional resources, or even a tool that can help, then sign up for our software now at ProjectManager.com.